La Louisiana, Parte Settentrionalle, Scoperta sotto la Protettione di Luigi XIV, Re di Francia et Descritta, e Dedicata Dal P. Cosmografo Coronelli, All'Illustriss, et Eccellentiss, S. Zaccaria Bernardi su dell Ecc. S. Francesco. 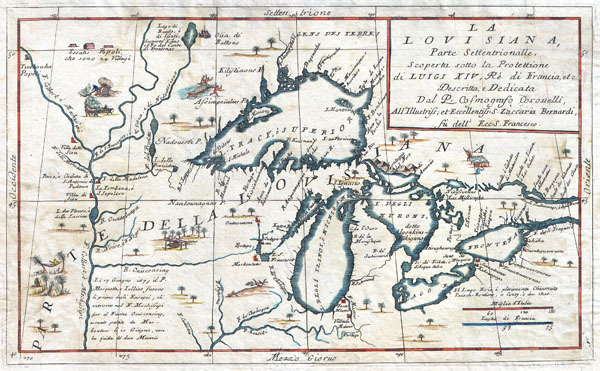 This exceedingly rare 1694 map by Vincenzo Coronelli is the most important depiction of the Great Lakes and the headwaters of the Mississippi River to appear in the late 17th century. Covers all five Great Lakes and extends westward as far as the Mississippi River valley. This map is a careful study of the Great Lakes Region and reveals Coronelli's fascination with this area. Coronelli derived his cartographic information from the reports of Jesuit Missionaries who were actively proselytizing in this region throughout the mid to late 18th century. These included the explorations of La Salle, Hennepin, Marquette and Jolliet, among others. Dotted with forts, Indian villages, and missionary stations. Shows the R. De Chekagou roughly where Chicago is today. Shows the Ottawa River route into Georgian Bay anda well developed mapping of Green Bay. This is also the most accurate early mapping of Lake Superior, in which both Keweenaw Peninsula (P. Kioanan) and Isle Royale (I. Miniong) are located. Features none of the mythical islands that appear in the Bellin map which appeared 100 years later. Decorated with numerous wonderful vignettes depicting the lives of American Indians. One in particular, a crocodile eating a man, is interesting and incongruous. This map is essentially an elaboration upon the 1688 Nolin/Coronelli map, 'Partie Occidentale du Canada ou de la Nouvelle France…' It was prepared for inclusion in the second edition of Coronelli's important 1695 Atlante Veneto. Vincenzo Maria Coronelli (August 16, 1650 - December 9, 1718) was an important 17th century cartographer and globe maker based in Venice. Coronelli was born the fifth child of a tailor in Venice. Unlikely to inherit his father's business, he instead apprenticed in Ravenna to a woodcut artist. Around 1663, Coronelli joined the Franciscan Order and in 1671, entered the Venetian convent of Saint Maria Gloriosa dei Frari. Coronelli excelled in the fields of cosmography, mathematics, and geography. Though his works include the phenomenal Atlante Veneto, Coronelli is best known for his globes. In 1678 Coronelli was commissioned to make his first major globes by Ranuccio II Farnese, Duke of Parma. Each superbly engraved globe was five feet in diameter. Louis IV of France, having heard of the magnificent Parma globes, invited Coronelli to Paris where he constructed an even more impressive pair of gigantic globes measuring over 12 feet in diameter and weighing 2 tons each. Coronelli returned to Venice and continued to published globes, maps, and atlases which were admired all over Europe for their beauty, accuracy, and detail. He had a particular fascination for the Great Lakes region and his early maps of this area were unsurpassed in accuracy for nearly 100 years after their initial publication. He is also well known for his groundbreaking publication of the first accurate map depicting the sources of the Blue Nile. At the height of his career, Coronelli founded the world's first geographical society, the Accademia Cosmografica degli Argonauti and was awarded the official title Cosmographer of the Republic of Venice. In 1699, in recognition of his extraordinary accomplishment and scholarship, Coronelli was also appointed Father General of the Franciscan Order. The great cartographer and globe maker died in Venice at the age of 68. His extraordinary globes can be seen today at the Bibliothèque Nationale François Mitterrand in Paris, Biblioteca Marciana in Venice, in the National Library of Austria and in the Globe Museum in Vienna, in the library of Stift Melk, in the Special Collections Library of Texas Tech University, as well as lesser works in Trier, Prague, London, and Washington D.C. Coronelli's work is notable for its distinctive style, which is characterized by high quality white paper, dark intense impressions, detailed renderings of topographical features in profile, and numerous cartographic innovations. Coronelli, Vincento. Atlante Veneto, 1695 2nd edition. The Atlante Veneto was a Venetian cosmographic atlas issued by the Jesuit Minorite friar, geographer, and globe maker Vincenzo Maria Coronelli. The Atlante Veneto was a massive work consisting of some 13 volumes in four parts. The first section focused on a general introduction to geography and included notes a various geographic systems and globes. The second part consisted of world maps from various periods and in various styles, including double page maps of the continents and poles derived from his earlier globe work. The third part focused on hydrography and included nautically styled maps of important rivers, bays, oceans, lakes, and gulfs. The fourth and final section detailed exploration and describing noting various explorers and their discoveries. The whole consisted of some 191 engraved charts and maps as well as an assortment of views and decorative plates. The atlas was conceived as a continuation of Blaeu's Atlas Major and in many respects follows Blaue cartographically. Many of the other maps are derived from Coronelli's own earlier globe work and exhibit various distinctly globe-like elements. Coronelli first issued the Atlante Veneto in 1691. A second edition was prepared and issued between 1695 and 1697. Most of the individual map plates remain identical between editions. The maps of the Atlante Veneto are universally admired for their exquisite engraving and high production quality, including fine paper and premium inks. All examples were issued uncolored and have typcially been left as such by dealers and collectors. Very good condition. Minor spotting here and there, else clean. Blank on verso. Burden, Phillip D., The Mapping of North America: A List of Printed Maps, 1511-1670, #701. Kershaw, Keneth A., Early Printed Maps of Canada, #163. Karpinski, Louis Charles, Bibliography of the Printed Maps of Michigan, 1804-1880, p. 117. Karpinski, Louis Charles, Maps of Famous Cartographers Depicting North America, p. 55. Goss, John, The Mapping of North America: Three Centuries of Map-Making 1500-1860, 45. Tooley, R. V., The Mapping of America, 314. Phillips (Atlases) 521. McMaster University Library, Research Collections, Accession # 107030. Newbery Library, VAULT folio Ayer 135 C8 1689 pl. 91. Osher Map Library Antique Maps Collection, OL260.